Got an assignment from a friend's recommendation. The requirement was to design a logo and a namecard for AT Commodities, a company that does trading from rice, cement, coffee, oil, tyres, stones and more. After a few rounds of revision, the client picked my 2nd logo design. My initial idea to was use blue and orange. Blue represents the company trade in solid and fundamental items like cement and stones while orange represents trading items like coffee and rice, things that people use and consume in daily lives. But the client prefer not to use orange, hence the purple in the final logo design. The arrows on the logo icon represent bringing trade commodities to customers from all areas or directions, with the circle being a point where customers are. Futura Bold Condensed is used as the font type as the font family Futura has an appearance of efficiency and forwardness. Happy with my completed work. Hopefully the client is too. It was nice working with them as the client always provides me with constructive feedback, enabling to project to complete with efficiency. 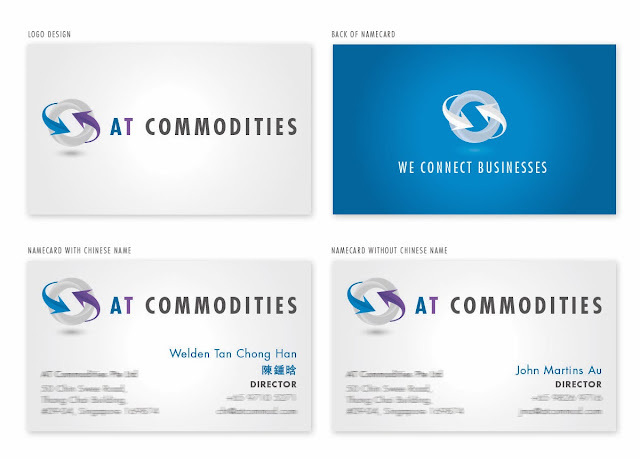 "Design : Logo + Namecard for AT Commodities" is a very nice post.